The Crazy Genie Slot comes from Red Tiger Gaming and is a five reels slot with three rows and 20 paylines. The set is in middle east and in the background of your reels you see a bazaar and on the left a magic lamp. Already starting from 20p you can spin the reels and the maximum bet also pleases high rollers: £500! The best feature of the slot is a wheel of fortune with 5 different bonus feature. The magic lamp, instant winnings or free spins – this is where you get lots of chances to win big. Spin the reels of your smart phone, tablet or desktop no matter where you are. Symbols and Payouts: The symbols of the Crazy Genius Slot are related to the theme or the familiar playing cards symbols. The latter are the low paying symbols 10, J, Q, K and A. You will win up to 80x your bet with 5 identical symbols. The theme related icons are the genie, a magic carpet, a serpent and a scimitar. You win up to 300x your bet with 5 symbols. The games wild symbol is the blue genius. It also pays 300x your bet and at the same time replaces all other symbols. The magic lamp is your scatter to start the magic wheel of fortune. Gold Bonus feature: You need 3 Magic Lamps on the reels 2, 3 and 4 to enter the bonus games. The first is the Gold Bonus. You can make 6 Free Spins with Extra Golden Coin Symbols. You can win up to 1068x your bet here with the right combination! Gift Bonus feature: The second possible bonus from the Magic Wheel of Fortune is the Gift Bonus. The genius himself shows you golden coins and you just pick one of them. Then you will be rewarded with an instant win. Treasure Bonus feature: The next bonus feature is the Treasure Bonus. You see a treasury of gold, gems and expensive items. Again, you have to make your choice and select the highest possible immediate profit. Lamp Bonus feature: The Lamp Bonus feature is especially exciting. If the Wheel of Fortune stops at the magic lamp, you have to rub the lamp. The result is a fantastic Win Multipler that makes your winnings explode. Oasis Bonus feature: The last possible bonus feature is the Oasis bonus. Here you have to beat the Magic Lamp to get your winnings. You can also trigger any bonus feature with the genius himself in the base game. Thus you have double chances to win nice profits. Every spin is exciting! 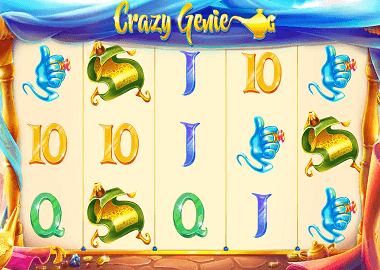 The Crazy Genie Slot is available in many online casinos for UK players. Red Tiger Gaming slots can you play at reputable providers only. You can find some of them in the table below. The Bet UK, Castle Jackpot or even UK Casino – everywhere you get a free bonus after registration. You can also play the Crazy Genie Slot for free. Click on the Crazy Genius banner above. You can find more Red Tiger online casinos on our Red Tiger Review page. You do not need to sign up or deposit if you want to play our slots.